How do you mean you are giving away 25 for free? I don't see any mention of that on the website.. I would also like some for free. Count me in for a freebie please! I'm in for the freebie too! I'll give a review when I get it, thanks. Is this an "idea" or a product that is ready to be shipped? What format is the private key under the halogram in? I like it... but how do we trust you not to up and steal all the coins in the private key one day? Still, a nice twist on the classic redeemable Bitcoin idea. EDIT: Would also like one for free. Alot of the posts and updates ended up on Twitter and Google+ instead of on my site actually. "I like it... but how do we trust you not to up and steal all the coins in the private key one day?" I don't keep logs or copies of the information provided, not just for your sake but for mine as well. If I kept a copy of addresses/keys and that list got compromised I would get blamed anyhow (as I should be). I know I have ZERO creditably right now which is the reason for the freebies, plus user reviews speak louder than my own. Key is clear and legible! This product is a total win. I don't know if it would work at the grocery store, but it beats paypal! The freebie would be nice, but maybe I can propose a trade? I make custom vinyl stickers, and I can make some for you in exchange for some cheques! Why did you bother to redact the QR code and the bitcoin address? You can compute the address from the private key. Not sure I want someone who knows that little about how Bitcoin works making Bitcoin financial products. How do you have firstbits printed on the bills before funding them? That isn't possible. You can't just guess what your firstbits will be. You have to get the address in the blockchain first. 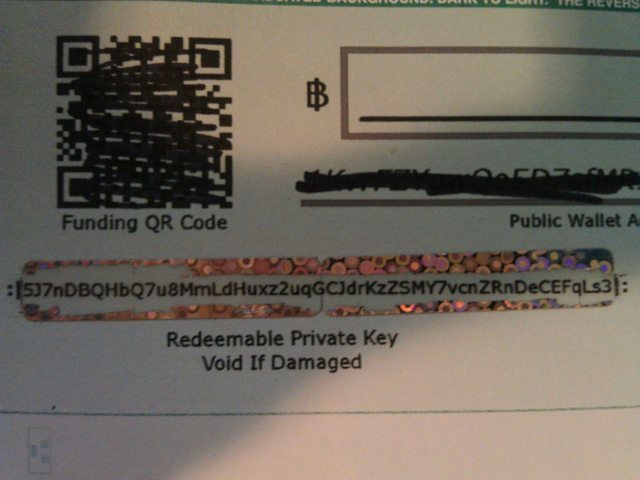 That was scrap check where the QR code was misprinted, I just scratched out the address with it. When the address is used it will appear in the block chain, I currently use 6 characters to avoid any mismatches, if this proves to be a problem I will switch to 7. However if someone else funds an address with same prefix before your customer funds his then the check will have the wrong firstbit. But they will also have an unfunded check leaving them no reason to check the transaction, also the reason for 6 characters. I would like some free if your still giving them away. But they will also have an unfunded check, also the reason for 6 characters. To be safe, I'd just send a satoshi to each of the check addresses to get them into the blockchain and have valid firstbits. I think it's a good idea to have the firstbits on the check, but better to be safe than sorry! You can use sendmany for each batch to minimize fees. It wouldn't cost more than a few cents total, definitely worth it IMO if you want to have a product that seems completely legitimate! Otherwise, you'll keep being asked the same question over and over about the firstbits.